With a little more money and a little less land, Delaware Street Commons members spent the weekend reworking plans for their cohousing project and feeling as if four years of planning was about to pay off. On April 21, the organization sold a $95,500 lot at 12th and Delaware streets to Tenants to Homeowners Inc. The sale helped cash flow and also made the adjoining site — where the commons will be built — more manageable, said charter member Linda Journeys. Now, instead of having nearly 30 homes in the community, the organization is looking at building about 24. Other cohousing communities around the country are finding that 20 to 25 homes is ideal, Journeys said. In a workshop Saturday, project members discussed other changes made necessary by the land sale. A common house — where community members will meet for occasional dinners — will now be built from scratch rather than renovating an existing structure, said member Vicki Penner. The 10 to 15 people who attended the workshop also paced off the property, discussed possible ratios of two- and three-bedroom houses and set a construction timeline that includes breaking ground sometime this fall. The atmosphere at the workshop was an optimistic one, Penner said. “I think there was just definitely an increased level of excitement and anticipation that the dreams, the things we have worked so hard for, will actually come about,” she said, adding that the sale of the land jump-started the group after a period of uncertainty. 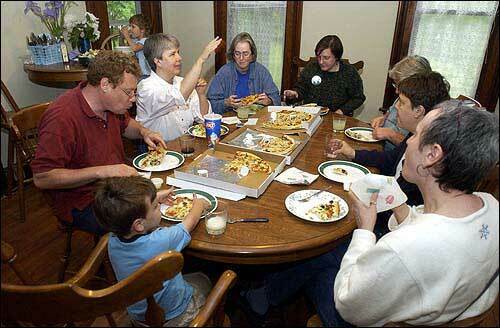 Members of Delaware Street Commons conduct a meeting over pizza. They met Friday at the McMillan House, 1208 Del. Planning for the cohousing project began in 1999, and when completed it will be one of only about 70 similar communities in North America, said Neshama Abraham, who lives in a cohousing community in Boulder, Colo., and is helping the Lawrence group. The idea behind the communities is to balance traditional advantages of home ownership with the benefits of shared common facilities and friendships with neighbors. The Lawrence group hopes to accomplish these goals through the common house — called by Abraham “an extension of your living room” — a pedestrian walkway, and by planning the development together. To learn more about the Delaware Street Commons or to attend one of the organization’s meetings, call 550-0163 or go to www.delaware-street.com. At least nine local families already have become full-fledged members of the project, meaning they have put down payments on homes in the commons, and Abraham expected all of the homes to be occupied by the time construction was finished. And although separate, those helped by Tenants to Homeowners will be welcomed by their more affluent neighbors. Tenants to Homeowners hopes to build five homes in the $40,000 to $50,000 price range on the lot, and commons members — whose homes will run $90,000 to $170,000 — hope to include them in common house and community activities. “To build new houses is pretty expensive, and one of the values of cohousing is to have economic diversity, family diversity, stations of life diversity, racial diversity,” Penner said.